Is Richard Pitino likely to be the first coach fired this season? Gambling site BetDSI has labeled Pitino as the most likely candidate to be fired first among coaches this season. At the very least, it underscores the perceived expectations for the Gophers. 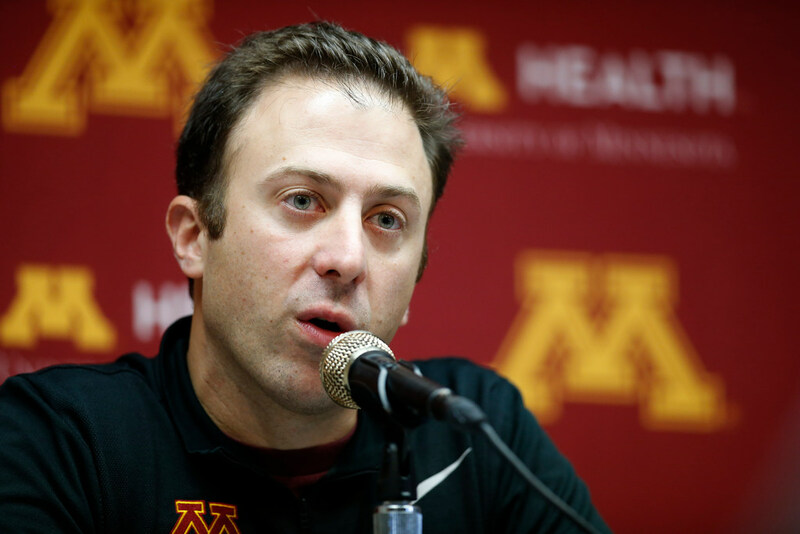 *In advance of the first big night of men’s college basketball action — including the Gophers’ opener against Omaha at Williams Arena — comes a reminder from an online betting web site of just what might be at stake for head coach Richard Pitino this year. Per CBSSports.com, the site BetDSI has labeled Pitino as the most likely candidate to be fired first among coaches this season. The odds are still 2.5 to 1 of him being the first to go — barely ahead of Maryland’s Mark Turgeon at 3 to 1 and certainly more likely to not happen than to happen — but it’s still instructive. At the very least, it underscores the perceived expectations for the Gophers this year, who finished a disappointing 15-17 last season after reaching the NCAA tourney two years ago. Last season was a mess filled with injuries — chronicled nicely here by Marcus Fuller — but the Gophers have the talent to make the NCAA field this year. If it doesn’t happen for Pitino, who has a 90-78 record which includes a disappointing 31-59 Big Ten mark in five seasons, he is certainly a candidate to be replaced by the athletic director who inherited him, Mark Coyle. *In a video that raises all sorts of interesting questions, several Ottawa Senators players were recorded during a recent Uber ride on a road trip in Phoenix bad-mouthing their coaches. The video was posted on YouTube and Twitter, though it has been subsequently taken down. The Ottawa Citizen has details, and the strongest comments come from Senators forward Matt Duchene. He can be heard ripping the coaching skills of assistant Marty Raymond. The players involved issued an apology Monday night. The bigger fallout could come from the perception of Uber, where passengers should have a reasonable expectation of privacy. *After the Cowboys lost 28-14 to the Texans on Monday Night, Hall of Fame QB Troy Aikman went on the radio Tuesday and blasted the organization’s current state. Dallas recently traded a first round pick for Amari Cooper, who had a TD grab Monday, in a desperate attempt to jump-start their season. The Vikings did that in 2010 with Randy Moss, and you’ll recall it didn’t work out so well. Poll: How will Richard Pitino's Gophers do this season?